Can replace BS chain as-is on existing equipment. Conventional chains experience initial elongation from assembly deviations and a general wearing-in period, which meant troublesome work in adjusting the equipment when starting up. 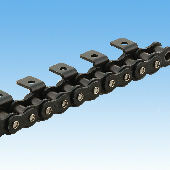 Lambda BS Attachment Chain greatly reduces this initial elongation, thereby reducing adjustment times. Please inquire for chain selection. Connecting link plates are coated with a black oxide coating. Offset links are not available for attachment chains.